W. W. Prescott was a prominent Seventh-day Adventist educator and administrator who was the son of a pioneer in the movement. Prescott was greatly impacted by the message of righteousness by faith presented in the Minneapolis time period. He embraced the message and began to preach it, sharing the passion of lifting up Jesus that so inspired A. T. Jones and E. J. Waggoner. 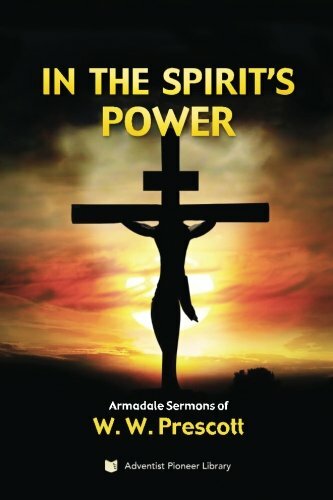 In 1895, in the Armadale camp meeting in Australia, he gave a series of Christ-centered sermons that had profound evangelistic impact produced by the Holy Spirit’s power. Commenting on these sermons, Ellen White wrote: “In the evening Prof. Prescott gave a most powerful discourse, instruction precious as gold.... God has given brother Prescott a special message for the people. The truth comes forth from human lips in the demonstration of the Spirit and power.... “We are doing our best to lead the people to look upon the Lamb of God that taketh away the sin of the world.... I attended the meeting and heard Prof. Prescott preach. I know that since coming to this place he has had the outpouring of the Holy Spirit.... [U]nbelievers turn pale and say, ‘that man is inspired.’” (Ellen G. White, Letter 82, 1905). “Professor Prescott's sermons will never seem the same, I fear, as when given by the living preacher: for the words are spoken in the demonstration of the Spirit, and with power, his face all aglow with the sunshine of heaven.” (Ellen G. White, Manuscript 19, 1895). In these sermons you will see Christ exalted as you may never have seen before. Your soul will be drawn to Christ as He is presented in such a simple manner, yet full of deepest significance.